Jen Jedda of JJ Caprices is on a journey of discovery. 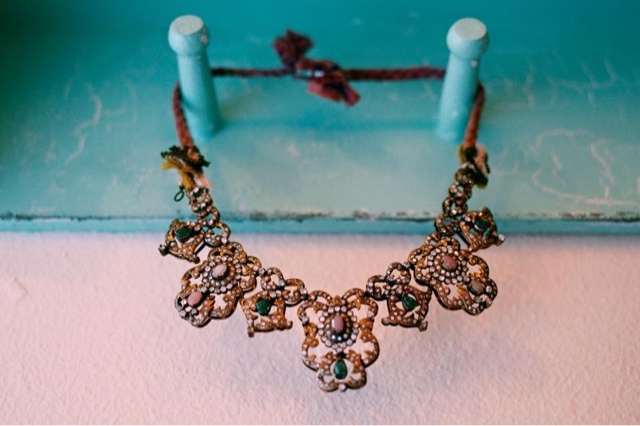 A Seattle-based nomad, Jen wanders the globe seeking treasures and one of a kind accessories for her online boutique JJ Caprices. 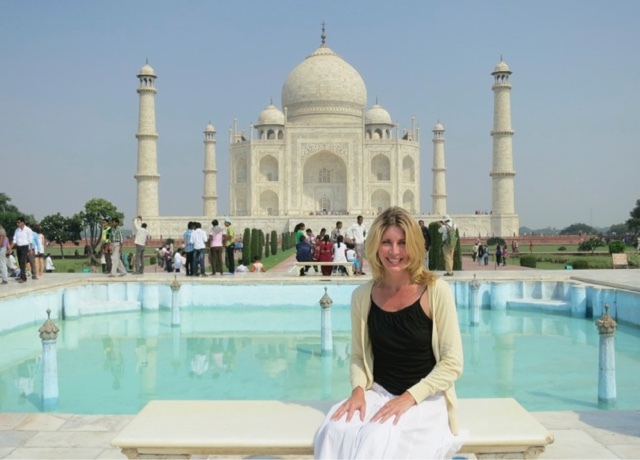 Since college, Jen has lived in 5 countries, learned 2 languages and traveled to over 39 countries! Jen expertly curates every item in her online boutique to showcase the craftsmanship, creativity and story of every artist she works with. We recently had the opportunity to sit down with Jen at the new Starbucks Roastery in Seattle to chat over coffee. How did you come up with the idea for JJ Caprices? I was previously a tech consultant. I always wanted to start a small business and have a passion for travel. I love visiting different places and am enchanted by things not seen at home. The name JJ Caprices is a combination of my name (JJ = Jen Jedda) and a french word (Caprices = Whim). My favorite wine shop while living in Paris was named Le Caprices de L'instant. I loved that name and wanted to incorporate it. My business is a marriage of flights and fancy and finding things along the way. How do you choose an item for your boutique? People often ask if I research destinations for artisans or designers prior to arriving, and the answer is “no”. To me, the joy – and the art of what I do – is literally stumbling upon pieces as I walk the markets and talk to locals. Once I find pieces or collections that enchant me, I then learn their back story and find out who made it, how it was created, what special techniques are required, and what makes it special. I love to get lost in the story of a piece. I choose those pieces that are the most interesting visually and ‘intellectually’. Additionally, I only feature pieces/designers that I have discovered while traveling in a country. Everything must be handmade in its country of origin and hand-selected by me. Some pieces I hand carry home while others I work directly. Do you have any stories to share from your recent summer travels to Mexico & Gautamala? 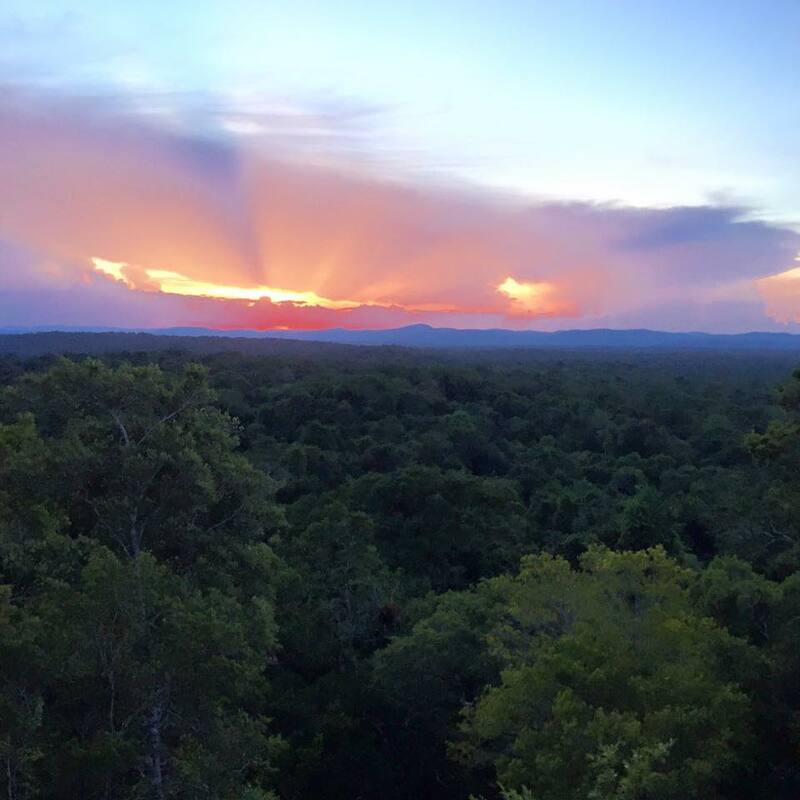 One of the most memorable moments was watching the sunset from Templo IV, the tallest pyramid in the ancient Mayan empire of Tikal in Guatemala. A highlight was staying in a jungle lodge in Tikal National forest where my neighbors were boa constrictors, tarantulas, toucans, monkeys, and ant eater-like creatures. I even was woken one early, early morning by the guttural, screeching sounds of howler monkeys. Not knowing at the time what it was, I woke up with quite a fright. I thought that had I lived in different times I would have sure thought that the sound meant the end of the world was upon us...it was that horrible. 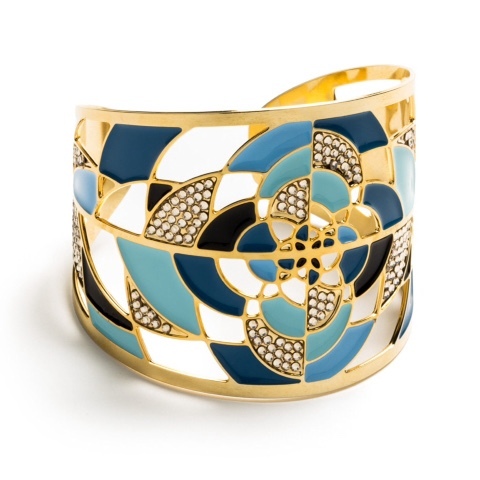 Did you find any new pieces for JJ Caprices from your recent travels? Research. Find places off the beaten path. Find out what the food actually tastes likes. (not where tourists go). Learn to say at least Hello and Goodbye in the language of the country you are visiting. Strike up a conversation with a local. Travel by yourself, but be sure you know where you are going and take safety precautions! What are a few items items you always pack? Any packing tips? Scarves - a pashmina is perfect for the plane. My technology - Laptop (Macbook), Phone (for taking photos), and converter (if needed). As I've gotten older, I like to pack less and leave room to bring stuff home. I will only pack a pair of earrings and find everything else at my destination. Less is more! And of course I always pack my Beauty Supplies. Any exciting JJ Caprices news or upcoming events? We have a small retail presence in a wine bar in Issaquah (just east of Seattle) called Vino Bella. 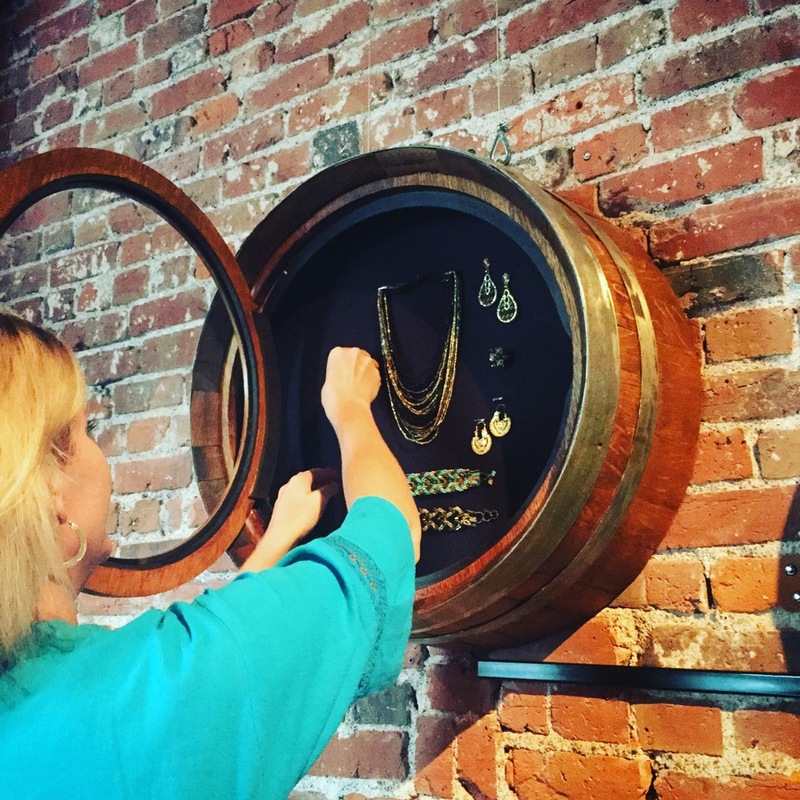 We had two shadow boxes custom made from the ends of wine barrels to showcase select pieces for customers to buy. They turned out beautiful and customers love them. The display gets refreshed every two weeks. For upcoming JJ Caprices events (because it is that time of year when we start doing a lot), visit our Events, Press and Praise page in the shop. JJ Caprices x Story of My Dress Giveaway! These beautiful earrings were handmade in a small community called San Blas Atempa in the State of Oaxaca. It is in a municipality of Tehuantepec. The traditional Tehuana dress and attire is what Frida Kahlo adopted during her life to show her solidarity to the strong women of this Zapotec society. The traditional garb consists of heavily embroidered garments accessorized with large amounts of gold jewelry. 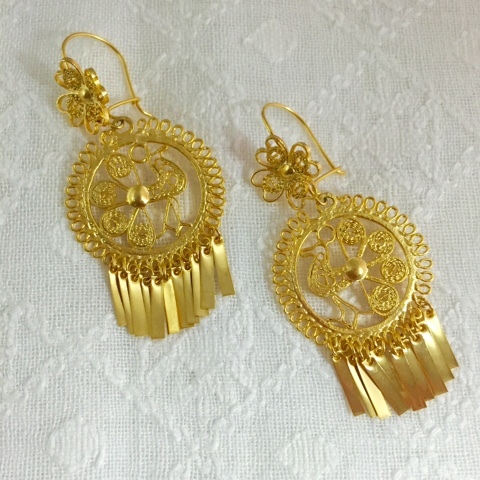 This jewelry often contains old, gold bearing coins and gold filigree earrings…like these! Frida was my inspiration for going to Oaxaca, so I was pleased to find pieces that were representative of what she may have worn. I bought them from a lovely woman in a market in Oaxaca City. She lives in this small community, and was noting that a lot of the young people don’t like to do this filigree work, so most of it is done by older hands now. Her name was Eolodia. I went to visit her several times during my stay…the last visit she gave me a little gift of earrings, placed her hands on me and said, “Dios te bendiga” (God bless you). Super sweet. 1. Comment on this Blog Post with your favorite travel moment. ***PLEASE NOTE - ONE Winner will be chosen from those meeting ALL eligibility requirements. Must be a US resident living in the United States. Giveaway ends Friday October 30, 2015 at 9p PST/12a Midnight EST. Also Jen is offering a very special 20% discount for Story of My Dress readers for all JJ Caprices purchases through December 31, 2015! Use code STORYOFMYDRESS at checkout. Perfect for gifts (and of course that includes a gift for yourself!) as we head into the holidays! Thanks so much Jen! We just love JJ Caprices! I frankly love all of your travel moments, as I feel like I am vicariously traveling with you. I especially love how much you honor all of the artists that you come in contact with no matter their social status. It's so sweet to see pictures of you on dirt floors talking to a tradeswoman or just enjoying the company of Mexican, European... children. You are amazing Jen, and your business model and heart are an inspiration. You go girl! My favorite travel moment is meeting my friend Amanda in Las Vegas - a leap of faith. 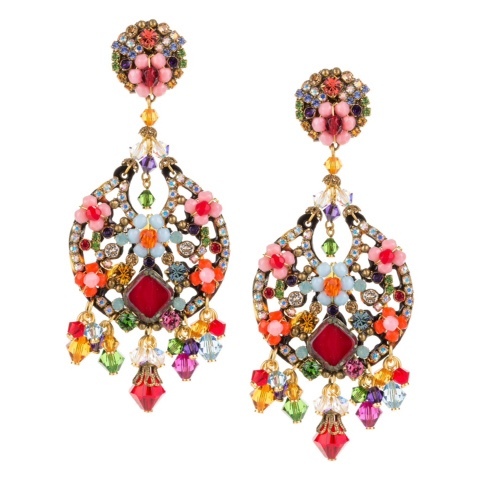 I would give these beautiful earrings to her. Wow just wanted to say what beautiful items! Unfortunately I do not have ibstagram, but followed you both on twitter. My favorite travel story was wandering around California and just exploring all of the beaches with my mom. We ended up going to a lot of side shops and then kayaking at la jolla. It was amazing! My favorite traveling moment was when my family and I went to Thailand to visit my cousins for the first time. The food was amazing and I loved connecting with my roots!